Tijuana artist Hugo Crosthwaite goes to Liberty Station daily and with no plan paints a mural. He’ll do this until Aug. 17. But in five months, his depictions of Mexican families will vanish — be painted over. And that’s his plan. 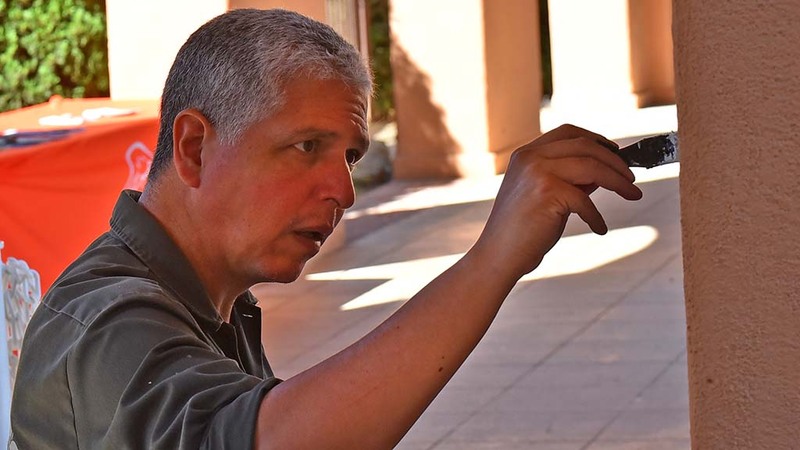 While the nationally renowned artist follows in the tradition of Mexican muralism, he is at odds with the notion of immortality of his work at Arcades Barracks 14 on Historic Decatur Road. It’s a very personal and humanistic experience, he said, similar to a musician in front of an audience. And that’s where San Diegans come in. Crosthwaite wants the public to watch his daily performances, sit back and have a dialog with him about it. The public nature of his performance, named In Memoriam, makes Crosthwaite stand out. “Usually art has this mystery to it because it is done in a studio,” he said. “You don’t know what the artist’s technique is. You just see the finished piece and you don’t see the making of it. Crosthwaite has performed in Chicago and Brooklyn and is pleased to see a variety of reactions. And it’s just this audience interaction that helped him get selected by the NTC Foundation’s Art and Public Place Committee. It chose six temporary art projects as part of a new rotating program titled Installations at the Station. The artists were chosen to add color and flavor to the arts district. She said Crosthwaite’s proposal was just “hitting on all cylinders.” Robin likes the live paint narrative, where observers influence how he is painting. “He might see someone, talk to them and have an inspiration, so in terms of all of the things we were looking for, his was just a win, win,” Robin said. 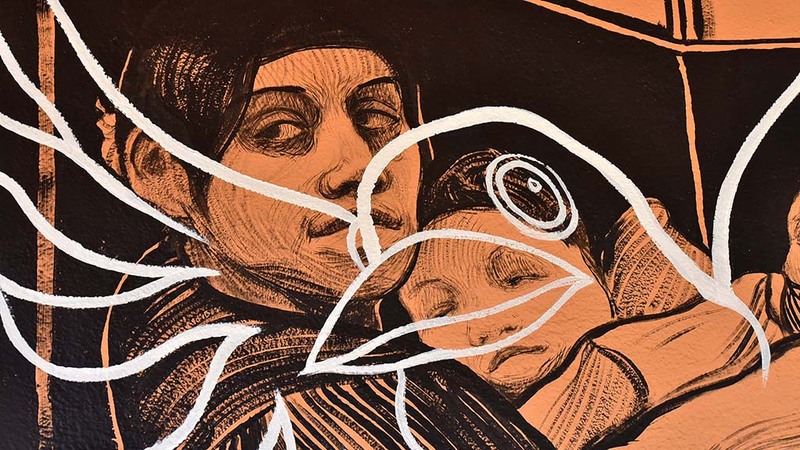 His first acrylic murals portray the tribulations of Mexican and South American families, in juxtaposition with local families shopping at Liberty Station, but he wants to avoid politics. So far, most passers-by have been shy, choosing to take a selfie with the art, rather engage in conversation. However one bicyclist on Tuesday shouted, “That’s awesome” as he flew by, and another asked why his subjects had sad faces. Crosthwaite envisions more possible conversations like this. He finished his fifth mural Tuesday and was looking down the walkway to an upcoming set. “There are six columns headed toward the comic book store (Comickaze Comics, Books and More) so that could lead to science fiction or robots or something,” he said. “It’s an idea of a dialog with the space, with the shops here, what people here are saying, what they are buying and what they are eating, and hopefully that will be influencing the narrative,” he said. Crosthwaite uses black and white acrylic paint to create layers in his art on the tan walls of the old Naval Training Center. He used black to illustrate the narrative, and white birds to add a second dimension of the soul or spirit of the family in the painting. While people often are used to “self-explanatory art,” Crosthwaite wants the audience to find its own interpretation. At performances in other cities, he said, children come up and see lines become faces and can believe that they too can create art. “So they go to the crayons or pencils and they try,” he said. Artwork already completed is “Rest Easy” by Lissa Corona of Oceanside and Marina Grize of San Diego, “Sky Mosaic” by David Krimmel of Normal Heights, “Rolling it Forward” by Jeremy Nuttall of Poway and “Twineline” by Karl Alex Roesch of Long Beach. One more — “Transcending Perception” by Josemar Gonzalez of City Heights — is expected to be completed by October. It will be a series of doors composed of images and a narrative created in community workshops. By September, the Art and Public Place Committee will begin the process of seeking artists’ proposals for upcoming installations. Some of the six current works of art will stay at Liberty Station as long as wear and tear allows. But Crosthwaite’s work is one of the temporary works destined for a paint-over after about five months. About the temporary nature of his art, Crosthwaite used the musical analogy: “You hear it, and then once the instruments stop playing, a silence comes over.